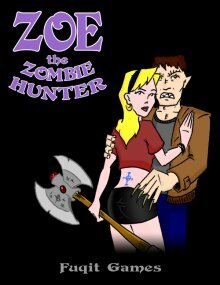 For seven seasons, audiences around the world thrilled to the exciting adventures of Zoe the Zombie Hunter and her “Josie Gang” of friends as they braved the horrors of high school, suffered heartbreaks, and occasionally fought monsters. Now you and your friends can live your own Sunnyvale adventures with the Zoe the Zombie Hunter Role Playing Game. This 76-page PDF contains background information, GM advice, and everything else you need to adapt the Zoeverse to your role-playing game. Best of all, it’s completely Free! ZTZH uses the QAGS Second Edition rules, available from Hex Games. Our games are free, but if you really want to give us money, we won't complain! To learn more about QAGS, visit the Hex Games web site. 2019 - Fuqit Games Powered by GetSimple Design by Free CSS Templates.